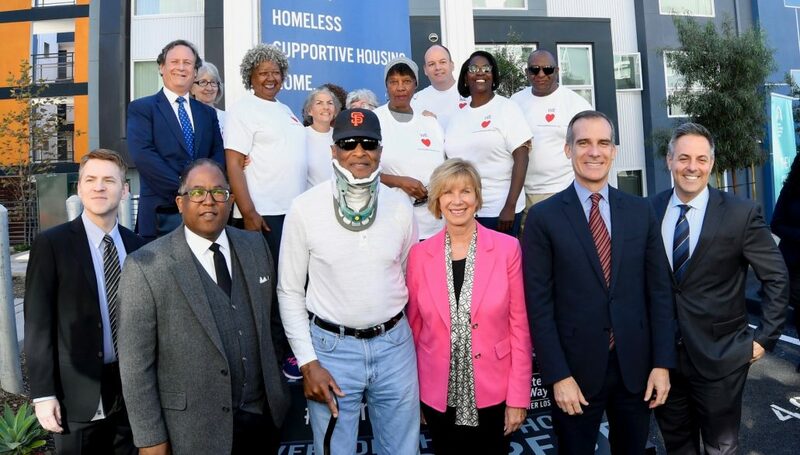 LAHSA Executive Director Peter Lynn, LA County Homeless Initiative Director Phil Ansell, Supervisor Mark Ridley-Thomas, Supervisor Janice Hahn, Mayor Eric Garcetti, Councilman Joe Buscaino and several Homeless Count volunteers celebrate progress in the fight against homelessness. All Photos by Martin Zamora/Board of Supervisors. 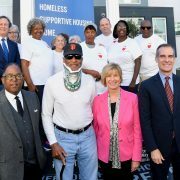 Standing in the courtyard of a brand new affordable housing apartment building, Los Angeles County Supervisors Mark Ridley-Thomas and Janice Hahn, and LA City Mayor Eric Garcetti and Councilmember Joe Buscaino announced that tens of thousands of men, women and children throughout Los Angeles County have been placed in permanent homes and interim housing since voters approved landmark initiatives to combat homelessness. They each encouraged everyone to help sustain this progress by volunteering for the 2019 Greater Los Angeles Homeless Count. 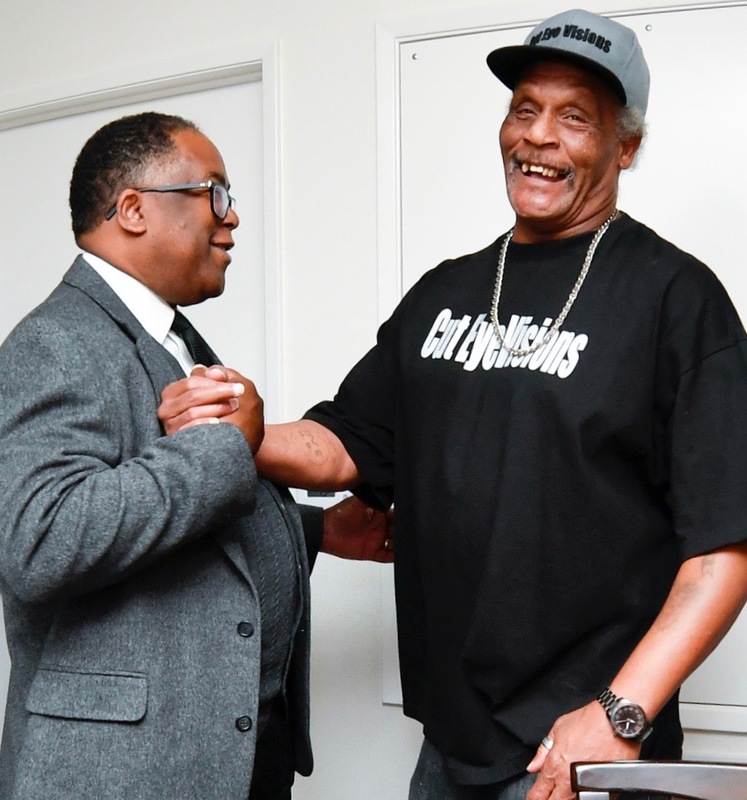 Supervisor Mark Ridley-Thomas greets 63-year-old Horace Lackey who, thanks to Measure H, just moved into the 127th Street and El Segundo Boulevard Apartments after living for years at a homeless encampment on 39th and Broadway in South LA. Photo by Martin Zamora/Board of Supervisors. 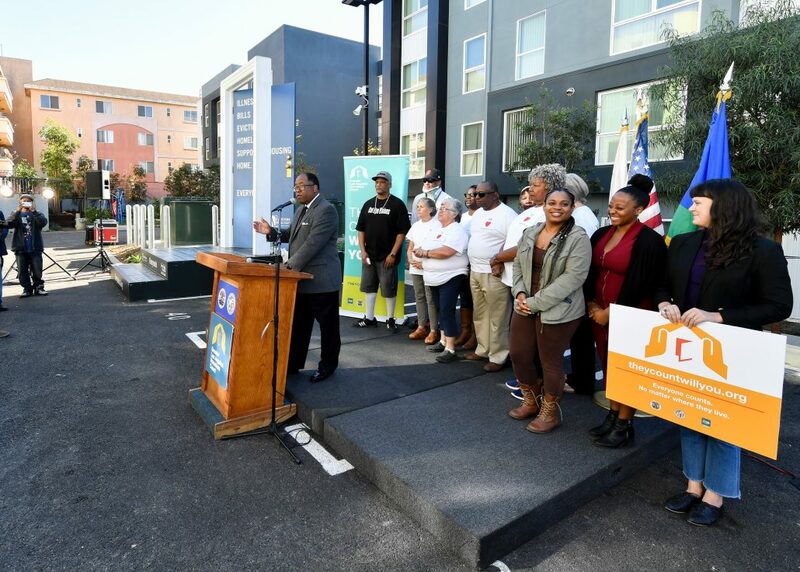 The progress report was announced during a press conference at the Harbor Gateway area’s newly-opened 127th Street and El Segundo Boulevard Apartments, a 160-unit apartment complex that includes the kinds of supportive services that Angelenos voted for by landslide numbers with 2016’s Prop HHH and 2017’s Measure H.
In the last 15 months, the Measure H quarter-cent sales tax has funded a major expansion of countywide homelessness programs including street outreach, emergency shelter, rapid rehousing, supportive housing, and benefits advocacy for homeless disabled adults, and thousands of people have received much-needed help — including 9,635 homeless men, women and children who are now in permanent housing. During the same time period, 18,714 people entered crisis, bridge and interim housing. Hiring vs. homelessness: As of September 2018, homeless service providers have filled almost 1,500 new jobs across the region. 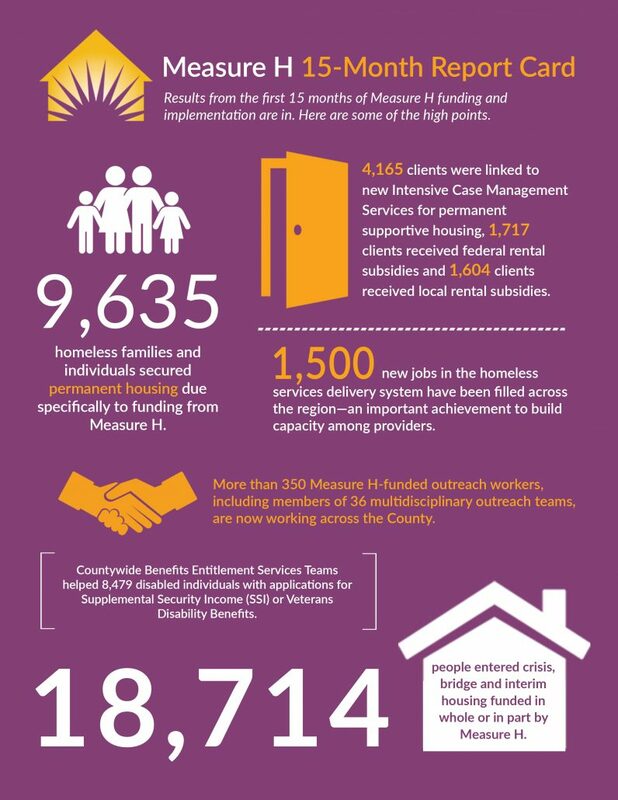 The Measure H progress report accompanied a volunteer drive for the 2019 Greater Los Angeles Homeless Count, which the Los Angeles Homeless Services Authority (LAHSA) will conduct from January 22-24, 2019. Since the November 2016 passage of the $1.2-billion Prop HHH, the City of Los Angeles has funded more than two dozen facilities with about 600 affordable apartments. As those continue to come on line, the City of Los Angeles has also launched A Bridge Home, designating city-owned real estate to help people come off the streets more quickly. 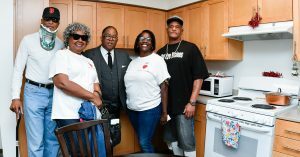 A Bridge Home has already opened temporary housing sites in Hollywood and Downtown. Thousands of volunteers sign up to join the Homeless Count every year, reaching 8,500 in 2018. Volunteers receive training and walk designated areas in small groups. LAHSA accompanies the street count with institutional counts, demographic surveys, a youth count, and statistical analysis in partnership with the University of Southern California that fully develops our picture of homelessness. Volunteer registration for the 2019 Homeless Count is live at www.theycountwillyou.org. The results of the January 2018 Count showed homelessness had fallen for the first time in years, decreasing by 4 percent to 53,195.